← HENRI RENAUD ET SON ORCHESTRE, Blues pour G.
Tommy Kent (born Guntram Kühbeck in 1942 in Munich) recorded the original German cover version of I Need Your Love Tonight for Polydor. It was one of the last songs Elvis cut before he left the US for Germany to serve in the Army. Incidentally, Tommy Kent started his recording career in the flexi-disc business, first recording for Hit-Ton (a postcard record label) and Roxy, a sub-label of Vox-Imago, who also pressed flexis for the Prima label. 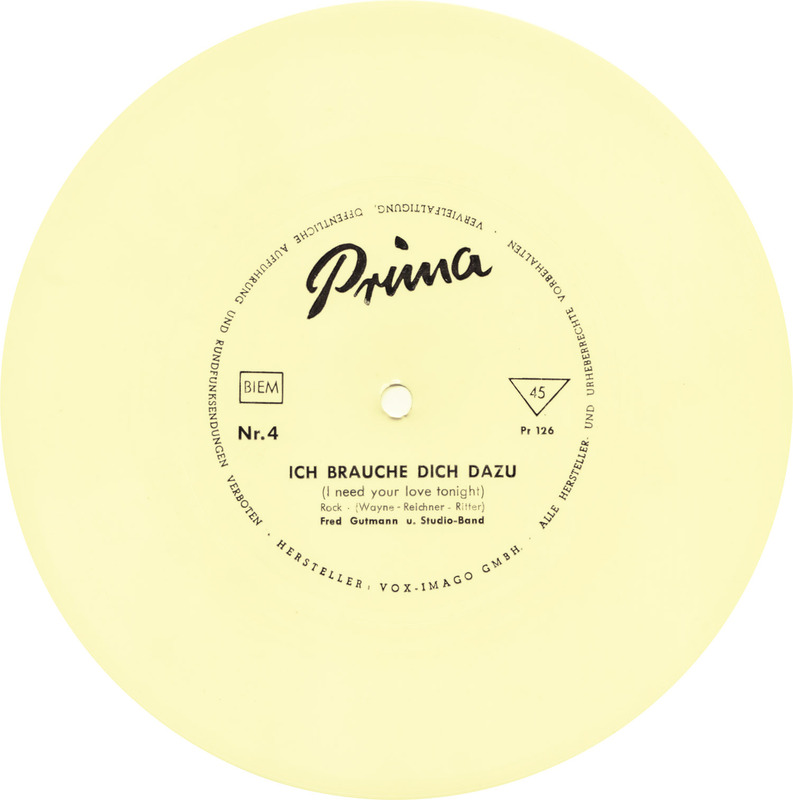 Unknown Fred Gutmann´s Prima version of Tommy Kent´s Ich brauche dich dazu, comes complete with reverb vocals and imitation of Tommy´s Bavarian accent. 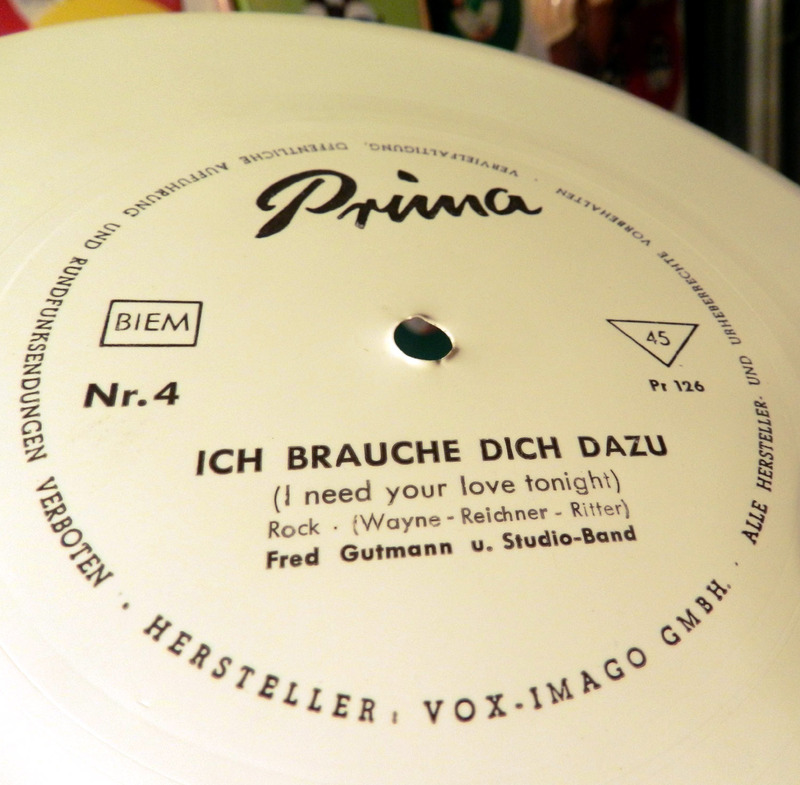 Gutmann recorded another rocker for the Prima label, a fine cover of Billy Sanders´ Daisy du musst schlafen geh´n. 90 Pfennig – that´s what these one-sided Prima flexi-discs sold for. Supposedly a throw-away object for teenagers, 55 years later my copy still plays fine. Plastic material can be quite durable. It´s possible. that this thin flexi might hold out another 55 years and still be around in 2070. This is playing at the wrong speed (too slow). You had me worried for a second. I just checked and played my copy of the flexi and NO, it´s the right speed! Listen to the file on the page, not the flexi. Lieber Kurt,ich habe mir beide jetzt noch mal wiederholt angehört und keinen Unterschied festgestellt. Die Flexi klingt genau so, wie die MP3-Datei, die ich aufgenommen habe.